When I wrote The invisible mom last year, it hit a sensitive nerve with parents. Many wrote to say they too had felt the sting of being left out of parent circles at their child's school. They too felt like invisible moms. There's still a gaggle of moms who stand in the playground at my son Aaron's school, and I still haven’t been welcomed into their circle. I've thought a lot about why I've been left out, and how I may contribute to my own invisibility. For example, in the past I always walked through this parent group with my head down. As a first step, I vowed to look up to see if I could make eye contact with anyone and initiate a smile. So far I haven't connected with any of the moms, which is disheartening. However, I've realized that if I want change to happen, I have to lead it myself. Here are six things I've been working on in the past year to make myself more visible at my son's school. I was fortunate to be asked to speak last March at a Parent Partnership Group at our school on the topic of What Inclusion Means to Me. It was the first time that I stood up to speak to other parents and teachers about how it feels to have a child with differences. I tried to be honest and authentic. I public speak for a living, but still, I was SO nervous. Not everybody liked what I had to say. I had a heckler at the back, a mom who felt that kids like mine took away from her kids' time with their teachers. That was challenging. But at least I had the opportunity to share my story with a larger group. I started to become more visible, at least to the small audience at the meeting. The Assistant Principal who asked me to speak on inclusion started to informally introduce me in the hallway to other moms who have kids with differences. My son Aaron is the only kid in the school who has a visible disability. In a setting of 900 children, it's impossible to identify who's the parent of a kid with autism or an invisible disability without some assistance. Turns out there are 27 students who have support in the classroom. I wasn’t alone! I discovered that I wasn’t the only one struggling with IPPs and calls from the school! Five of us moms started talking to each other in the playground about starting an inclusion group in partnership with the school. This would be a group of families with kids with diverse learning needs and anybody else interested in inclusion and building a compassionate school community. Some people in our disability community were not supportive of our inclusion group, and accused me of starting a segregated group, but I ignored them and soldiered on. We had to start somewhere. We started to meet for coffee at our local recreation centre. We met with the school's new Assistant Principal to plan a formal meeting. We only had four parents attend the first meeting, but our school trustee showed up! This was exciting to us. We wrote a Terms of Reference, and worked hard to partner with the school. As an added bonus, a mom joined our planning group who has typically developing kids, but who really believes in supporting us. That almost made me weep. We are not alone, even in our wider community. People do care about our kids. We just have to be given opportunities to find them. This fall our little group regularly met for coffee to vent, support each other, and come up with constructive suggestions to improve things at our school. We grew close, and survived a rocky meeting with the school about cuts to the educational assistant budget. We’ve had a setback, relationship-wise, with the school, but we aren’t giving up. We committed to showing up at every Parent Council meeting. Even better, we have a standing agenda item to give an update about what we're doing. The first time we had to present to this bigger parent group I was quaking in my boots. What was interesting is that the other parents said they wanted to know how to talk to their children about our kids and differences. They said they didn't know where to start. At the last meeting we shared an essay I wrote with some tips: How to be part of Aaron’s village. I haven't noticed a difference in how parents interact with me. However, last month as Aaron was walking to school one of the Parent Council moms shouted out to him: "HI AARON." This seemingly minor happening is a major breakthrough for us. If I want other parents to accept Aaron and me, I have to do my part to be more visible. So I’ve made an effort to volunteer more at the school. That way at least the kids in his class get to know me as Aaron’s mom. I’m a true introvert, and volunteering for Hot Lunch with the other moms is a BIG stretch for me, but my first shift is in January. Wish me luck. In December I met some of the moms from our inclusion group at a local fancy restaurant for a holiday lunch. We talked about things other than school, like where we went to university, our Christmas traditions, our other kids. We are getting to know each other as people, too, not just as "special needs" moms. At the end, we all gave each other a hug goodbye. I wish that the world was accepting of my son and our family, but that’s not our reality. I know from my paid work life that good change management strategy means that you celebrate the 20 per cent of people who get it (our inclusion group), and focus on the 60 per cent who are neutral or not engaged (like our Parent Council). The other 20 per cent, who don’t get us, like the heckler at my presentation? Forget about them. They aren’t worth your time or energy (Believe me, this is a tough lesson to learn, and I certainly don’t practise this philosophy every day). 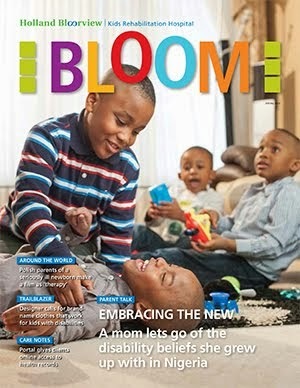 Because of our inclusion group, us moms are not alone. We greet each other in the hall. We no longer stand separately in the playground after school. We have found each other. We vow not to exclude others as they have excluded us. We are open to anybody who wants to join us. We listen to each other, root for each other, and our kids are slowly getting to know each other too. This is awesome. Aaron now knows the names of the inclusion moms' kids, and they greet each other and high-five in the hall. He’s building his own community too. Even when things aren’t okay, they will be okay because we have found each other. Here’s to building safe spaces, like BLOOM, where we can support each other and share information. I truly believe in my heart that together we are stronger. Please share any strategies here that you've tried to promote your family's inclusion at your school. Thank you so much for this post. 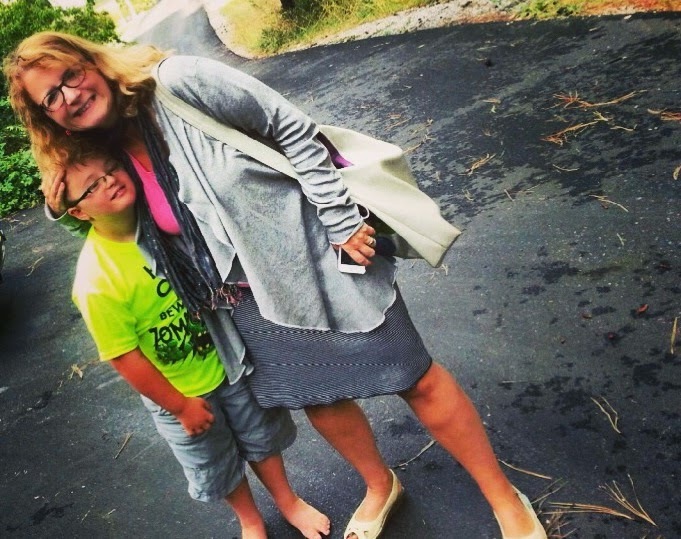 Your words and thoughts resonate through my experience as a special needs mom. I work outside of the home so unfortunately do not drop off or pick up my son from school, so I too feel isolated at school events because I have not connected with the "other" moms. I find other mom's avoid my eye contact as they maybe do not know what to say. It saddens me greatly knowing that Nate has many friends at school, yet rarely gets invited to birthday parties. It is often the adults in the lives of children that set up segregation and isolation for our children. You have inspired me to become more entrenched in my son's grade 1 world and his school community to help it become an inviting, enticing place for all of us. Dear Nate's mom: Thank you so much for your comment. I've struggled SO hard with this issue the past nine years since Aaron began preschool. You rock, Sue, and continue to be an inspiration!! Aaron and the other kids with labels own a piece of that school, like every other student! Ah Lin, you were the one who taught me, in that first peer support training session in Calgary very long ago, about honesty, storytelling and the power of listening and being true to ourselves. As a mom of an older child, you were my role model for all of that good stuff, and started me on this journey. THank you, Sue, Louise,AND TO ALL OF YOU, for being the pathfinders and wayshowers for your children and the world! We all have some wonderful dreams and we can help each other make these dreams come true. Sue, I loved your original piece and I love this one too. Good for you to take the lead. Our lives are already so full and we shouldn't have to do this, but no one else is going to take on that role. My daughter has left high school now, but when she was younger, I found that connecting with the children was my best "in" with their parents. Because of my daughter's mobility and other health issues, her school staff "invited" me to chaperone on all the field trips (read that "if she is going to be able to attend, we need you to come," but couched in such a way that we wouldn't protest). It was a great way to get to know her classmates and for them to see the very normal, natural parent-child relationship we have. My presence was needed for her to be able to participate in Student Council and some of the other student activities, so I got to meet many children at her school. Because they knew us both and knew that I would help when needed, they weren't afraid to invite her to birthday parties when she was younger. It helped their parents be less afraid of my daughter and she was a good bridge. Yes, I only ever had coffee dates with other special needs moms. But at least the moms of classmates smiled and gave me eye contact when we crossed paths. And a couple weeks ago, when I was at the grocery store by myself, one of my daughter's former classmates surprised me by saying, "Hi, Mrs. Angela's Mom" (truly, that was my name at the school). Here I thought I was only visible when she was with me...but I was recognized as a person in my own right. I hope this encourages you as you volunteer for Hot Lunch in January. Children can be amazing bridges at times. Thank you so much for your article. I have the same feelings and tried to hit the ground running with my son’s school as he just stared kindergarten this year. Fortunately for us we have started school well with a season special ed teacher and a terrific school principal. I have found myself as the co-chair of the parent council and made sure that I made time to make constructive contribution to our various fundraising endeavours. All of the parents know my son and greet him warmly when we arrive. Other children do the same as well. I live in Scarborough and thus far I am learning that many of my fellow parents are immigrant families who seem to be either shy, not confident or simply unaware of the fact the they can be a party of their child’s school. Bussing in from other neighbourhoods is an issue too epically for families with more than one child. Nonetheless I am determined to meet and befriend other parents. I am personally not too concerned about being included into the smaller circle of mums that gather and chat but I do try in my way to be available and when the occasion arises I share some of my son’s challenges and strengths too. So far so good but I have yet to hit the stage of my son realizing if and when he is being excluded socially. I am certainly aware that these days will come. My hope is that I will be able to learn how to find parents and kids who would like to have my son around. Thank you for your articles. I was really touched by the first one and your follow-up falls right into my way of thinking. Congratulations and keep posting good ideas please. Hello Mariana - out of our small group of five 'founding moms' there is one mom who does not have a child with special needs. She's interested in creating a welcoming and kind school community for all kids (bless her)...and she's also very connected with the wider group of moms. So now, we have just one fabulous mom, but I am hoping with time, it will grow!!! I'm so enjoying this dialogue. Thank you to everybody for your responses! Gail, thank you for your peace and blessings. One thing I know is that we are all in this together...and as I said, together we are stronger. Bloom is such a supportive forum for that. Rose-Marie - I LOVE hearing from parents who have older children - that gives me such hope for the future. Aaron is only in Grade 6, and so we are only halfway through, and I know I have so much to learn, especially from parents like you. Thank you for your lovely article. I'm afraid I could have been one of the moms too busy in the happy circle to notice you. I apologize. I am the mother of 2 typical grown daughters. I would have been delighted if a special needs mom had asked my children's teachers for volunteer students to buddy up/partner with a special needs child! Gifted children especially would be great for this job because they're often ahead of the class academically anyway. Children who have difficulty making friends with their peers might find it easier to relate to someone whom they perceive to be non-judgmental. How about enlisting the assistance of the Student Council and interviewing candidates for buddies? Present it as an honor to be chosen for the job and then offer some very basic training on how to be a friend to someone with differences. My daughters had reading buddies in early elementary school (first graders paired with third graders, for instance). Why not offer a similar typical/non-typical partnership? Sue, a wonderful article! Only a comment from another person who is embracing her introversion - be strong for the hot lunch work and then reward yourself with something you enjoy afterwards to recharge - quiet time with a book or cup of tea. I can do the extrovert stuff if I can give myself time to unwind quietly afterwards. How many red flags on mental health do we need? Acceptance: What does it mean to you? Would your kid like to do this?